Minister Ze'ev Elkin gives speech at Bar Ilan University: Wave of terror is preview for collapse of Palestinian Authority. 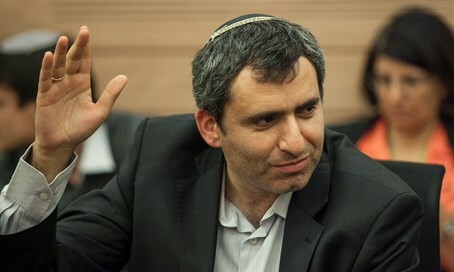 Minister for Immigration and Jerusalem Affairs Ze'ev Elkin (Likud) gave a talk at Bar Ilan University this morning (Monday), in which he presented his approach to the challenges that will face Israel once Mahmoud Abbas no longer runs the Palestinian Authority. "The current wave of terror is a preview for the collapse of the PA. Most of the likely scenarios for the day after Abu Mazen [another name for Mahmoud Abbas] will lead to a lack of organized inheritance, to an internal fight for succession, to anarchy and the dismantling of the PA," he said. "The ones who will have to pay the price for anarchy in the PA are Israeli citizens, particularly the communities in Judea and Samaria. We must prepare for even worse attacks." Elkin added that "the question is not if the PA collapses but when it is going to collapse. This is the reason we must prepare our security and stop the futile discussions over whether or not it is good for the State of Israel. The PA will collapse whether we like it or not and the State of Israel had better accept that the train has left the station. At the moment, sadly, it seems that we have not yet internalized the new situation and we are not properly preparing ourselves. He further noted, "The international community must also stop trying to strengthen the Palestinian Authority, because it is just an attempt at resuscitation that will blow up in our faces. It's true that there are a number of scenarios, but the most likely scenario to me is that anarchy will result from the lack of a clear successor to Abu Mazen, due to his unwillingness to hold elections for the presidency and the surplus of legal and illegal weapons in the PA's territory. There is no point in trying to revive the PA, and instead we should make a fitting headstone for its grave, along with that of the Oslo Accords. The Palestinian Authority was born with Abu Mazen, who initiated and pushed for Oslo, and the PA will disappear with Abu Mazen when he goes." Despite this, he does not believe that even elections could change the outcome. "Most of the Fatah candidates will never win an election against Hamas. The only one who will is in Israeli jail - Marwan Barghouti." Regardless of how it happen, though, "if the PA collapses the world will blame Israel." Elkin explained his attitude towards the Oslo process: "The mistaken concept in Oslo lead us to today's reality. We made a mistake when we brought the PLO leaders out of Tunis, we made a mistake when we though that they would deal with terror and incitement, and we made a mistake when we allowed them to run their education system, media and sermons without supervision. All of these led to the building of a generation filled with a burning hate for us and cause a 13-year-old girl to leave her school and stab Jews to death. "In order to fight against the ongoing wave of terror," he concluded, "We must treat it with antibiotics and not with aspirin. We need to understand that today's terror was born from 23 years of neglect, ever since the Oslo Accords. Therefore, we must reach down to the roots, which are incitement in schools, in the media and especially in sermons. In addition, we must prepare for our security and to understand the new field. The source of authority is not excessive hierarchies and institutions, it's identifying the new players below the surface in a timely manner. If we know how to identify them quietly, we can deal with the situation. There's no doubt that this is a ticking bomb that can still be dismantled, if only we can wake up in time."